I've always had this idea in the back of my head that Cantata would be a game that people would want to read about in the way you used to look at a game's manual before playing it. Things in the guide wouldn't necessarily be essential teachings, but instead would add flavor to your actions in the game as well as its universe. Unlike a lore book, chock full of tiny details, or a wiki, transactional and dry, you can imagine the Cantata Guide as what you would see on the back of the box when you pick the game up in a store. It's what you read as you're walking to the checkout line, what gets you excited about playing the game. 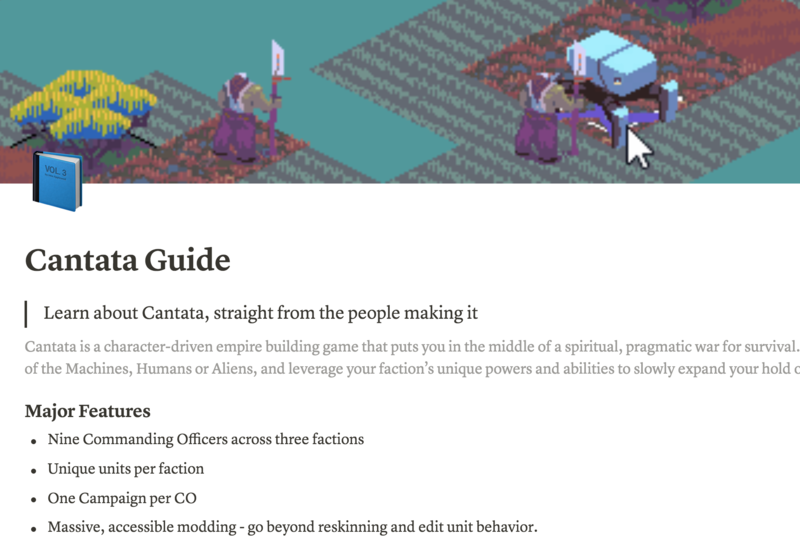 So with that, we're happy to today launch The Cantata Guide, a living a document of the game's systems, world, and everything in between. Take a look and poke around. It's small now, with humble aspirations, but we hope to grow it over time as the game develops, responding to how features and mechanics change as well as what happens in the world of the game shifts and develops.